I’m happy with the transition to paperless. I like reading books on a tablet. But sometimes there is something about a real book; the feel, even the smell, and the different ways a real book can be marked-up. Or add sticky notes. I’ve disposed of a lot of my old books in the past few years. I will probably never read any of them again. And I miss them! 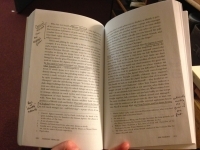 This entry was posted in Books, UX on August 28, 2014 by Tony Dye. Absolutely agree! Plus although you can access the file of the book on the tablet – who knows in 20 + years if you will be able to access it. The media forms evolve so quickly. So, I personally have fiction and books that I don’t think I will ever reference again on my Nook but still purchase hard copies of books that I think I may want to reference at some point in the future.